Finding your destiny may seem like a stretch if you only have one day to live, but it’s not entirely impossible. The musical adventure game Ephemerid shows that magic do happen so long as you have love, friends, and rock n’ roll. Ephemerid is about a simple mayfly, who one day emerges into life deep in a paper forest. Granted a short lifespan, it soon finds itself a mate. But its happiness disappears when a clueless city-dweller captures it. Thus begins the mayfly’s struggle to go back to its home. The story unfolds in 12 chronological stages, beginning with the mayfly’s birth. As the player, your task is to figure out how to move the mayfly forward in each stage. This usually involves tapping to the tune of its original rock guitar soundtrack to clear obstacles, but occasionally physics come into play. For example, in the birth stage you will find the mayfly resting on a branch. You can launch it into the air by holding down the branch and letting go. In another stage, you sort groups of shooting stars to join the same-colored constellations and watch as they burst into colorful fireworks. Once you’ve completed a stage, you can come back to it any time by tapping the bottom right corner of the screen. You can also change the tempo of the songs from this screen, which in extension adjusts the difficulty level of the game. Ephemerid emphasizes on delivering a complete experience. As tactile and engaging the game is, it is possible to remain a passive player throughout the experience. The game doesn’t time or score your efforts, and there is no actual way to fail. Another thing to note is that the game doesn’t include any sort of tutorial. Right from the start you’re left to figure out things on your own. Fortunately, the game is very intuitive — all it takes is just a couple of poking and prodding and you’ll be good to go. Safety-wise, parents should watch out for the Facebook and Twitter links on the home screen. You should also know that the app deals with violence and death: there is a scene where a spider is seen eating other insects, and another where the mayfly eventually meets the end of its lifespan. I would say the app would be suitable for kids ages 5 and up. The app in entirety is a one-of-kind concept. I can think of a couple of musical adventure games, but none is directly comparable. It is also executed quite nicely. Looking at the graphics and sounds, it’s an audiovisual treat for sure. Each stage looks (and sounds) different from the others. The mesmerizing particle effects add liveliness to the paper scenes, and further enhance the fantasy theme. And at the heart of the app is the original rock guitar soundtrack, which would be a hit with any ’80s child. My only complaint is the lack of challenge in the gameplay — as I’ve mentioned before, it’s possible to take on a mostly passive role and still complete the app. While I understand the focus is on providing a complete experience, the gamer in me would feel more satisfied and engaged if there were a risk/reward system. Still, I wouldn’t disregard the app as it is a lovely experience overall. If anything, the pressure-free gameplay makes it accessible to younger players. 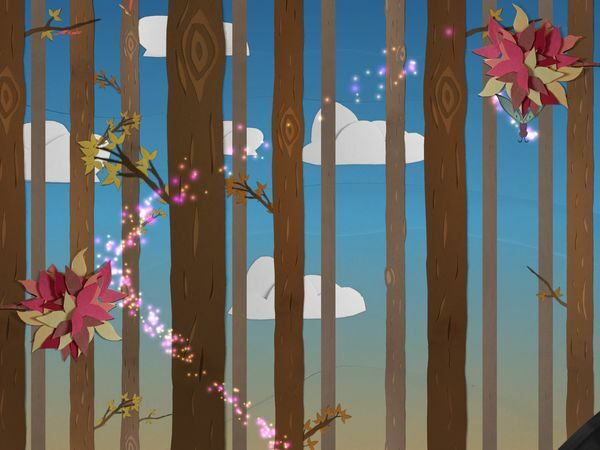 Ephemerid is a charming interactive love story set to a rocking guitar soundtrack. In every stage, players explore a handcrafted paper world and solve simple puzzles to move the story forward. Navigation is intuitive and wordless, which makes the app as accessible to younger players as it is for adults. Recommended for those who enjoy games that lean heavier on providing a unique experience.